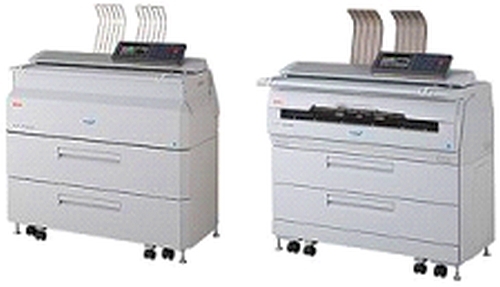 The OKI Teriostar LP-1040MF (left) and LP-2060MF Multifunction Printers. OKI Europe has launched two new wide-format Teriostar multifunction printers designed to boost productivity in busy design, engineering and reprographics offices where deadlines are tight. The LP-1040MF and LP-2060MF can print up to seven A1-size prints per minute and up to nine A1-size prints per minute respectively – the fastest in their class, said the OEM. Scan speeds of 240 mm per second and parallel processing of tasks also help accelerate workflow. Both models feature the industry’s only user-replaceable process cartridges. New features, said OKI, make these printers simple and intuitive to use. For example, all controls are managed at the front by a clear 8.5” colour touchscreen panel that gives rapid access to frequently used menus. Exceptional print quality is assured with a new Print Data Converter that fixes typical problems such as speckles, slants or the kind of errors sometimes seen with scan data or file converter data. Enhanced Teriostation2 integrated software is standard on both. This delivers complete network access to the copier and enables users to send jobs, including multiple files, to the printer from anywhere on the network using the most common file formats – TIFF, PDF and others. New security features include identification with a smart card for print, copy and scan. This prevents unauthorized use, the risk of leaving sensitive drawings uncollected, and also eliminates waste and controls job logs. These new models also enable the complete deletion of data on the hard disk drive (HDD) if the printer is sold, leased or returned to the owner.